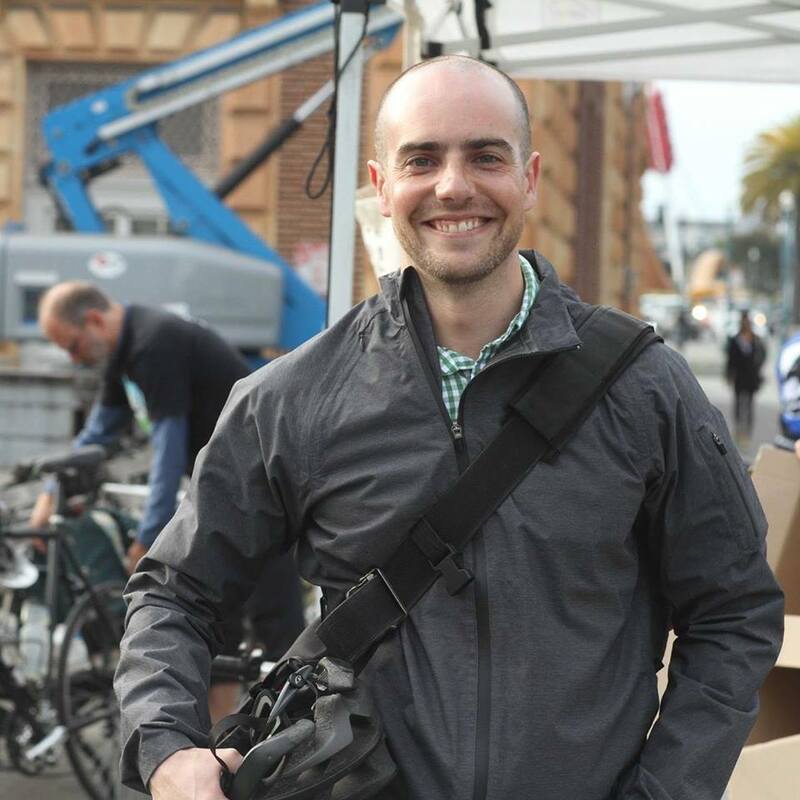 Earlier this week, the SF Bike Coalition announced it is tapping its development director, Brian Wiedenmeier, as its new executive director. Wiedenmeier takes the reigns from Margaret McCarthy, who had served as the organization’s interim director during a search to replace Noah Budnick, who resigned last year. Streetsblog sat down with Wiedenmeier to find out more about him and his goals for the organization. Streetsblog: So why bike advocacy? Brian Wiedenmeier: I associate cycling with joy and freedom, I began riding a bike as a child and as someone who grew up in a small town in the Midwest. It’s not cool after 16, so I bought a car to get to my job. But when I went to college at the University of Minnesota a car was not something I could afford, so I started biking again out of necessity. But then I realized what a freeing, amazing thing it was–this simple machine that let me experience the city in a new way. SB: Tell us about cycling in Minnesota. BW: Minneapolis is a great city that’s blessed with a network of fully separated bike paths that run through parks. And they have the midtown Greenway which is an old piece of rail infrastructure, a freight line that ran in a trench through the city. It’s been re-purposed exclusively for the use of bicycles and pedestrians. It’s a magic thing with bicycle on-ramps and off-ramps that get you cross town in no time flat. SB: But you decided to move to San Francisco. How was that, cycling-wise? BW: Ten years ago it was possible to move here on a whim. I’d visited before and fell in love with the urban fabric and the beauty of the city and its climate. Even when I visited 15 years ago, there were already lots of people biking. It called out to me as a place you could live without a car, take transit, walk and bicycle. All those things were appealing. The first thing I did was spend a couple of hundred bucks on a refurbished Nishiki. That’s how I got around. SB: San Francisco didn’t have much bike infrastructure back then. BW: The Valencia Street bike lanes were striped back in 2000. That was one of SFBC’s first victories. Mary Brown, former Membership Director of the SFBC, was a champion in organizing the community to stripe those lanes over intense opposition. We’ve seen, since that time, the number of people biking surge, on Valencia in particular. SB: I wanted to ask you about Valencia. This publication recently got a video of all the cars blocking that bike lane–there were about 10 cars in one mile. BW: I think it’s time to take a look at the facility that exists on that street and reassess if it’s adequate enough. I was pleased to see the city install one of their bike counters on Valencia along with the other automated counters to provide us with some data on the massive number of people using it to bike. Enforcement and education are parts of the solution, but we can’t have traffic control officers posted 24 hours a day at every intersection monitoring double parking. Protected bike lanes could be a real solution to solving the double parking crisis on Valencia. SB: There’s tension, obviously, between people who want to park their cars, people who want space for bikes and, sometimes, even with people advocating for bus lanes and better transit. How does one strike a balance? BW: Good design gives space for people biking. But it also gives space for people loading and unloading cars, space for people on transit vehicles and it gives ample space for people to cross the street. The changes coming to Masonic are a good example of a complete street and I’m excited to see the incredible improvements. The bike facilities are going to be great, but it will also have a full street-scape improvement, with really appealing public art, a plaza at Geary… and a design with space clearly marked for biking. When it’s complete it will be a template for other street projects. SB: The bike lanes will be raised, but not protected. BW: The pilot on Market will be instructive. I hope what they are taking from that is raised bike lanes also need designed in a way to discourage autos from parking on them and using them for loading and unloading. There are ways to do that with a higher curb cut, more paint, and a more distinct barrier. SB: What about protecting intersections? The Masonic plan doesn’t do that. BW: There are treatments they can do, such as continuing the lane through the intersection with paint. New York and Oakland on Telegraph do sharrow markings through the intersection. It’s just paint. But it is better than nothing. In its next round, we want SFMTA to look at doing protected intersections, whether it’s a Dutch-style intersection or we have models to look at in Salt Lake City and Davis. SB: If you could graft the infrastructure of another country or city on SF, from anywhere in the world, where would it be from? BW: The obvious answers are Amsterdam and Copenhagen. I’ve been to Amsterdam and I loved biking there. I would look at London’s bike ring-road project too, which created a whole new piece of infra just for cycling. I’ve also heard wonderful things from people who’ve traveled to Colombia and have experienced Ciclovía in Bogota. That’s a city that’s done a lot without fancy infrastructure. The one thing both London and Bogota have in common is strong leadership. You have strong mayors who pushed, with Peñalosa in Bogota and Boris Johnson in London. SB: Speaking of leadership, what do you think about San Francisco’s? BW: There are a lot of encouraging things that City Hall has accomplished in the last few years including citywide commitment to Vision Zero. That said, I think there’s so much more that city hall could be doing for people that bike. We want even stronger support for the kind of projects, delivered in a timely fashion, that keep people who bike in this city safe. For example, we want a police department that uses data driven enforcement and is really focused on the kind of traffic behaviors that cause serious injuries and fatalities. SB: But the bike yield law, which tried to force that on the police, failed to pass earlier this year. BW: The SF bike yield law was always about using data. It was in response to a sting operation in the wiggle, where people not coming to a complete stop were being targeted–but only people on bikes. While we didn’t have enough votes to override the mayor’s veto, I think the message about data-driven enforcement has been heard. Along with Walk San Francisco, we’re going to be doing training at all 10 police precincts with their commanders to get them to focus on Vision Zero and how their enforcement helps us achieve that goal. We’re going to present them with their own data to show them which stations are doing a good job on the “Focus on the Five” most deadly violations. SB: If you could fix one street, and one intersection in San Francisco, which would it be and what would you do? BW: I’d look at the most dangerous spot for people who bike. Octavia and Market for the intersection? I would put protected bike lanes down Market from Octavia to the Embarcadero. SB: What are your main goals for the next year? BW: Three things. One, reducing barriers to biking in low income and communities of color, and doing that in partnership with the community-based organizations that we already work with and hopefully strengthening and building some of those partnerships. Two, focusing resources on improving bike infrastructure in all parts of the city, not just areas with bike traffic now… our southern and western neighborhoods in particular. There’s a great hunger for safe places to bike. And three is about Vision Zero and making sure we’re holding the city accountable to its goals. SB: Describe your vision for an ideal San Francisco. BW: It’s a city where people of all ages, in all neighborhoods, and all backgrounds feel like biking is an option for them and it’s something they do at least occasionally, if not regularly. It’s a city that has zero traffic fatalities and zero serious injuries. It’s a city where the bicycle is an affordable transportation option that makes it possible for working and middle class families to remain in this city despite the rising costs. A city with clean air and vibrant public spaces. And it’s a city that people around the world look to when they want to design streets smartly. Streets focused on people and not the automobile. SB: Thanks for your time. And good luck in your new position. BW: Thanks. I want your readers, and SFBC members, to know I am 100 percent committed to this organization and helping it achieve its mission. Wiedenmeier’s official start date as Executive Director of the San Francisco Bicycle Coalition is Wednesday, July 6. After yesterday’s shout-fest against #keepmissionred, then today two hit and run murders (one a driver running a red light, the other passing in the oncoming bike lane), it’s clear SFBike needs to take stronger positions, to treat Vision Zero seriously and rescue it from its present farcical state of “balanced approaches”, to stop making absurd endorsements like those of the past two mayoral elections, and to demand an end to vehicular through traffic in GGP. San Francisco is engaged in a battle over whether Transit First, in the charter since Milk, is going to be treated like legitimate law and not lipservice. There is a very vocal, very angry minority who will make any hare-brained arguments they can twist to their own selfish purpose, and people like Chu, Lee, and Campos instantly surrender. We can’t allow more decades of delay and “compromise”. It’s time that the majority view, a majority which expressed itself in crushing measure L, be respected, and that rational, transit first policy be implemented despite the unruly mob. SFBike needs to be at the head of this fight. I hope the people and the members of SFBC will give him a chance to lead, regardless of what vision he sets forth. He seems like he’s got good potential. I’ve gotten pushback before from SFBC due to my “confrontational language” in regards to SFPD’s lack of enforcement. I love the SFBC, have been volunteering for many years and will continue to do so. I just wish they’d stop playing nice and call lack of progress for what it is. They’re currently “celebrating” the coming redesign of Polk St, which is a complete failure in terms of bicycle and pedestrian safety. Its sickening they’re framing the redesign of Polk as a win for bicyclists and pedestrians, when the original plan was very watered down to preserve parking. That being said, I think Brian is the type of leader the SFBC has been lacking since Leah left. I have high hopes for you Brian, lets do this! CU, one of the conditions of being a beneficiary of city hall’s patronage system is that you are not allowed to criticize the patron.